Change is at the same time the most natural and the most difficult thing in life. Life is in constant flow and cannot stay the same, but then again, change is often scary, hazy and unwanted. If everything's fine now, why change? And if everything is not fine, why the change is not already coming, no matter how much we've hoped and wished for it? I'm probably from the more change-oriented side than most people, because I'm so curious and always ready for experiencing new things in life. However, lately I've felt for the first time that change can also be scary - so scary that it paralyses and prevents action. My life is 90% frigging great now, as I have almost everything I could have dreamed of. I'm married to my soul mate, I have a beautiful new home, steady job, enough income, established social circles, activities that make me feel that I'm living my purpose (tarot, volunteering etc.). Given that everything's so well, I've got 10 Pentacles a lot lately - the card of permanence, structures in life, home and family, wealth, everything being as steady and complete as possible. But, this is also the card of comfort zone and complacency. And with having a lot comes the fear of losing a lot. I've repeated like a parrot that the only area in my life I'm not entirely happy with is my job. It's a great steady position but it offers zero percent of inspiration or creativity. I understand I'm not the only person who's dissatisfied with a seemingly OK role and I don't want to come across ungrateful because I'm definitely trying to see the positives (even though tarot does remind me of that, too, by offering 4 Cups a lot - the card of complacency, ingratitude, boredom, not seeing the blessings in front of my nose). Where these two cards tie together is the fear of change. 10 Pentacles is completion and 4 Cups is about not being happy with what one has, but still being unable to break the rut - maybe there's laziness,lack of effort, ideas and direction. But both cards talk about stalling. Ideally I'd find a job that better suits my personality and still offers the same benefits as my current role, but herein lies the catch: what if any other role doesn't come with as good perks? What if I hop off from the ice bucket to boiling water and regret it, with no possibility to backtrack? So, I am my own worst enemy in achieving this goal. This year I'll see things clearly and will have an excellent plan to execute. I'll see and speak the truth. The year will be filled with fast-paced action, change and communication. I'll be exchanging messages back and forth and "feeling the wind in my hair", it's so thrilling and fast. But, I'll also grow tired with something: I'll acknowledge things didn't go where I wanted them to go and I'm simply not satisfied enough to keep what I have. I must walk away to seek satisfaction from someplace else. 8 Cups has been stalking me since this draw and I've thought it relates to my job. 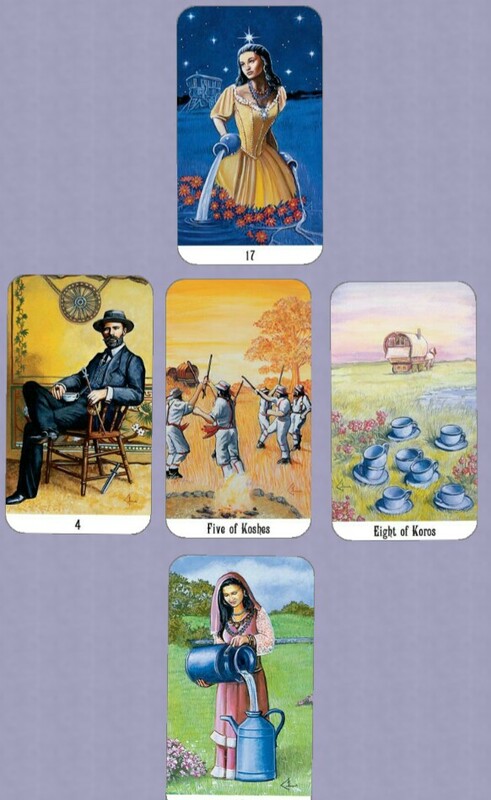 However, with tarot, cards have a tendency to keep popping up if the message is not delivered or no action is taken. I've been confused why I still get this card, when I've identified my job as the "lack of fulfilment" area and I've tried my best to seek fulfilment, by focusing on all the positives and mainly concentrating on topics that matter, such as this blog and my studies. Try to remember not to take life too seriously, it can be light-hearted fun, a competition and a game. Also, if you want to get to a new place in life and in particular, get a new job, it takes effort and competition. It can't be avoided and there's no point in shying away from this moment of frustrations and trying to win, to come out on top. You have learned by now to combine and balance, mix and compromise in life. Use that skill. Seek for balance in all areas of life. I've been a very one-sided person before and this ongoing job situation has definitely helped/forced me to seek balance and be patient. I used to have zero patience with long-term projects or issues, I'd give it a quick go and then abandon it in frustration or out of lack of interest. So growth as a person has definitely happened, thanks to the boring job. Emperor talks about leading my life solely relying on the logical, rational, "masculine" side of the brain. I can see based on this card that the change heralded by the 8 Cups is not just about my job or external situation, it's about a major shift in thinking: my world view and values. A few years ago, I was still very much a science-believer and wouldn't account anything spiritual, paranormal, metaphysical etc. I've always been artistic but saw that as "nice to have" skill instead of something more - because it's so difficult to earn a living as an artist. I had pretty much been indoctrinated by the modern society, politicians and the economists to believe that what has monetary value is what matters, and what has to do with emotions, intuition, kindness, "soft skills", is additional extra but not as important because you can't export it to earn money. Duh, what an unbalanced way to think and live! One side can't work without the other and I've gone through a crash course to learn to appreciate "feminine" traits and values, such as intuition and creativity. 4 - What you will gain from this change - 8 CUPS. Here's my stalker again. Interestingly, it came up as a positive (what I'll gain) and I also got this in a position of family and friends in another spread yesterday, so now I finally understand the message. I've been emotionally unsatisfied with my social circles, because I mainly work and socialise with people who are quite different from me personality-wise. Most are not very interested in deeper questions in life and that's what's lacking. I need a quest to find my tribe, people whose thinking and values resonate better with me. Not that I'd abandon my current friends, but there's always room for more, isn't there! Star means guidance, positive take, optimism and direction and I generally read it to mean: you're following your higher guidance, you're on the right path. So this card in this position is a double whammy - yes, what you're leaving behind what you're gaining is a beneficial change you need to make to fulfil your destiny; to be the best version of yourself. Embrace the Change, done with Buckland Romani Tarot.